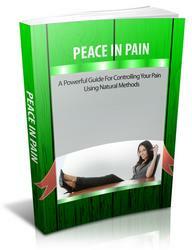 The Ease Chronic Pain Program is a complete how to guide for permanently curing even the worse cases of chronic pain. Youll be given a comprehensive list of different foods and supplements which, when combined in the specific way. Every single food or supplement youll find inside The Erase Chronic Pain Program is 100% natural. 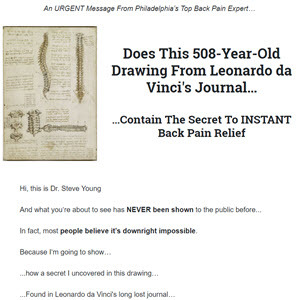 The Key to why this works is that for each evil neurotransmitter in your brain, there are other natural organic chemicals that, when introduced into your body, immediately break down those pain-causing agents and bansih them from your body. Scientific study after scientific study has already shown that the different chemical compounds, included inside this guide counteract these biological pain amplifiers. 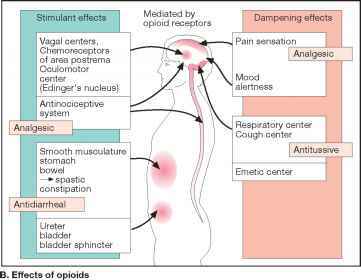 Clinical trial designs often employ parallel placebo-controlled and randomized withdrawal types of experimental manipulations.14'35 The majority of these designs have been well validated using opioids however, the relative utility in assessing novel analgesics that target specific aspects of chronic pain (e.g., neuropathic allodynia) await further evaluation (e.g., non-NSAID (nonsteroidal anti-inflammatory drug) mediated analgesia in the third molar extraction model). Action Kinetics Morphine is the prototype for opiate analgesics. Onset approximately 15-60 min, based on epidural or intrathecal use. Peak effect 30-60 min. Duration 3-7 hr. tV2 1.5-2 hr. Oral morphine is only one-third to one-sixth as effective as parenteral products. Uses Intrathecally, epidurally, PO (including sustained-release products), or by continuous IV infusion for acute or chronic pain. In low doses, morphine is more effective against dull, continuous pain than against intermittent, sharp pain. Large doses, however, will dull almost any kind of pain. Preoperative medication. To facilitate induction of anesthesia and reduce dose of anesthetic. Non-FDA Approved Uses Acute LV failure (for dyspneic seizures) and pulmonary edema. Morphine should not be used with papaverine for analgesia in biliary spasms but may be used with papaverine in acute vascular occlusions. From neuropathic pain to chronic pain of malignancy, and all types of pain are associated with increased suicidal risk. Pain is undertreated particularly in patients with HIV and AIDS, in part because of the common prevalence of substance abuse disorder. Pain is especially common in this setting and ranges from 28 to 97 across various studies (Schoefferman, 1988 Lebovits et al., 1989 McCormack et al., 1993 Reiterand Kudler, 1996). Pain clearly can interfere with all stages of sleep. Chronic pain in HIV-positive patients may still be underestimated and undertreated despite data demonstrating that pain is a common symptom in this population (Breitbart et al., 1996 Larue et al., 1997) Disrupted sleep may result when doctors are hesitant to prescribe sufficient analgesic medications to treat complaints of pain from patients with a history of substance abuse, or they may undertreat pain when the cause of pain in an HIV-infected patient remains uncertain even after a thorough workup. The technique of applying electric currents to the spinal cord or a peripheral nerve to relieve pain is known as electroanalgesia. Its use with both permanently implanted and nonsurgically applied devices is common practice in the treatment of patients suffering from chronic pain. Dilaudid (hydromorphone) deaths are occasionally encountered. It is prescribed for use in chronic pain. Deaths are usually accidents caused by a patient's taking too much medication. It is 7-10 times as potent as morphine. Oxycodone (percodan) and meperidine (demerol) deaths are uncommon. Uses Restrict use for the management of severe chronic pain that cannot be managed with less powerful drugs. Only use on clients already on and tolerant to narcotic analgesics and who require continuous narcotic administration. Contraindications Use for acute or postoperative pain (including out-patient surgeries). To manage mild or intermittent pain that can be managed by acetaminophen-opioid combinations, NSAIDs, or short-acting opioids. Hypersensitivity to fentanyl or adhesives. ICP, impaired consciousness, coma, medical conditions causing hypoventilation. Use during labor and delivery. Use of initial doses exceeding 25 mcg hr, use in children less than 12 years of age and clients under 18 years of age who weigh less than 50 kg. Lactation.